We would never worship a golden calf, would we? Admittedly Aaron had a tough job. No one had ever been high priest before. He was no theologian. A few weeks ago, he was a slave like everybody else. Moses was gone and had been for an uncomfortably long time and he left very little in the way of instructions. Now Aaron was faced with a nation on the verge of becoming a mob. We want to worship something, Aaron. Make us gods to worship. Something outside us. Something greater than ourselves. Things are uncertain. Restore a sense of balance, familiarity, comfort to us. Make us gods. And Aaron, wanting to capitalize on the moment, wanting to harness the emotion, announced, “Tomorrow is a festival to Yahweh!” They took something they had created out of their own imagination, using their own resources and called it GOD and worshipped it. We live in a culture that is grasping for gods. God help us not to use our own resources, our own imagination, and craft for them what they want. An emotional experience. A platitude. A compromise. Call it God and worship it. Sometimes we are not much different than the culture we live in. Too often we seek the comfort of a god we design, a god who is close to the True God but whose standards are more flexible … and familiar. Too often we look for emotional gratification, an experience, or intellectual validation, reassurance, rather than spiritual transformation, repentance, holiness. More often than we’d care to admit, we create something, call it GOD and worship it. God help us point people to what they need. God help us not settle for anything less for ourselves. The gospel. The truth. Transformation. The One True God, Maker of heaven and earth. He is God alone, worship Him. Why do people settle for something less than the One True God? In what some writers have called Jesus’s last will and testament, He bestows His peace on His disciples. Let’s take a few moments and consider what an awesome gift this is. An end to enmity with God and a restoration of the relationship. Relief from wondering where we stand before God. Calm reassurance in the most trying circumstances. Harmony in our relationships with those around us. Stillness in the midst of the noise of the world. A foretaste of the eternal rest that awaits us. A confident knowledge that it is complete and irrevocable. So in John 14:27, Jesus, our great High Priest assures us His peace is a free gift resulting from His sacrifice. It isn’t meted out based on our work or worthiness or even proof that we have or will use it wisely. Now compare it to the last line of Aaron’s blessing on Israel. Because he was the High Priest, when Aaron spoke these words, he was pronouncing the blessing of Jehovah Himself. It conveys the idea of living under the full measure of His grace, favor, joy, and protection. He is the Father whose delight in us is boundless. Spanning the Old and New Testament, peace is the summation of our relationship with God. It weaves together what He’s done for us, all that’s is available to us now and what we look forward to. 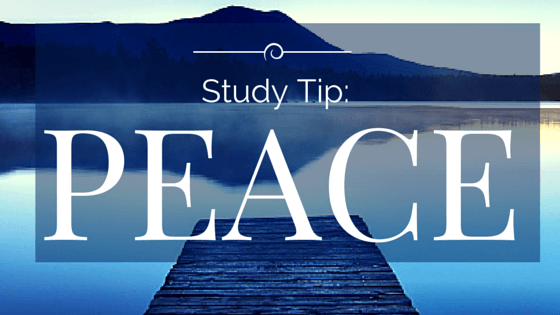 As you study, be on the lookout for the word peace and take to heart the things you learn. In your daily life be ever more mindful of His peace. The calf was fashioned from plundered gold. Jehovah is self-existent. The calf didn’t exist before Aaron made it. Jehovah is eternal. Aaron announced the calf was their god. Jehovah is the I AM. God’s work or the work of our own hands. We will follow our own ideas, our own philosophy, our own system. Or we will choose to follow God’s.